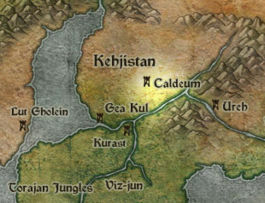 Kehjistan is a great empire in the East which include cities like Caldeum, Viz-jun, Ureh and Kurast. Khejistan on the world map. Kehjistan has a history that goes back several thousand years. On the eastern edge of the Twin Seas lie the emerald jungles of Kehjistan. Several thousand years ago, hunter-gatherers found themselves drawn to the lush, fertile rain forests and bountiful game inhabiting Kehjistan. But there was something else; Kehjistan's geography was rife with nodes of magical energies, and eventually those with innate, arcane abilities began to sense and recognize these forces, gathering in groups to settle these special areas. It was here that the original mage clans, the Vizjerei, the Ennead and the Ammuit, were founded. Unfortunately the history of Kehjistan is not a peaceful one, and the Mage Clan Wars that erupted nearly destroyed the clans. Sages would come from far and wide to study and collect the rare plants and animals that make their homes in the rain forests of Kehjistan up until the first demonic war, when the jungle became far too dangerous to visit, let alone inhabit. Entire villages, even small cities were wiped out. The coeval capitol of Kehjistan, Kurast was now under siege by the powers of Hell, and was kept safe only through powerful magical barriers that just barely held the demons at bay. Even through the short troubled times, the nation still managed to prosper. Emperor Hakan was the last regent to rule the country in prosperity. As he be came ill and his son Hakan II took over, incompetence ruled the land and much fell to ruins and slum. The intolerant Zakarum religion re-emerged, and quarrelled with the mage class. Kehjistan encompasses almost one-third of Sanctuary's eastern hemisphere. With an average rainfall of over four hundred inches per year, Kehjistan has the largest rainforests in the known world. This huge expanse of jungle feeds the Argentek river, which is the longest, widest river in Sanctuary. Hundreds of smaller rivers and tributaries twist and turn their way through the lush tropical forests until they finally unite with the mighty Argentek. Herbalists and alchemists revere the rainforest environment for its ecological diversity. This page was last edited on 18 October 2012, at 17:32.